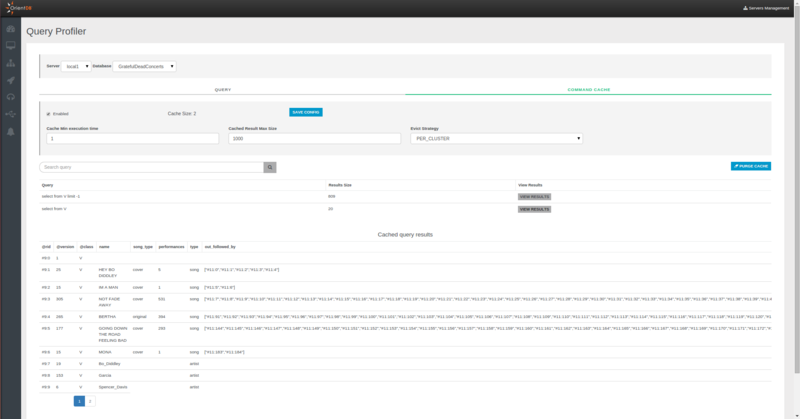 Starting from version 2.2, Studio Enterprise Edition includes a functionality called Profiling. To understand how Profiling works, please refer to the Profiler page. In the above section you can choose the server in order to investigate queries executed on it and manage the local cache. NOTE: This feature is available only in the OrientDB Enterprise Edition. If you are interested in a commercial license look at OrientDB Subscription Packages. Through this panel you can manage the cache of the specific server and consult the cached results of queries by using the VIEW RESULTS button. You can even filter the queries by the "Query" field and purge the whole cache by using the PURGE CACHE button.